Hazardous Area Lighting LED based Class 1, Division 2 certified L- ? 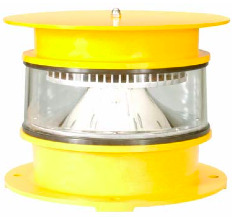 ?Tested & Certified by Intertek Testing Service (ETL) per FAA AC 150/5345-43E Complies with ICAO Annex 14 Medium Intensity Types B (Flashing) & C (Fixed) The FAA L-864 LED red flashing 300mm beacon is specified for use on stacks, towers and other aviation obstructions. Light has a clear acrylic dome with Corrosion resistance that meets the US Military Standard Salt Fog Test conducted per MIL-STD-810E, Method 509.3, Procedure I. The FAA L-864 LED beacon includes an internal flasher and photocell for standalone use or it may be installed with a system controller and a PPC photoelectric controller. Point Lighting supplies the product of an FAA certified manufacturer. Note: Type FAA L-864 may be used standalone as it includes the flasher and photoelectric controller, but no alarm. The standalone type L350 includes flasher, photoelectric controller and alarm. Synchronization of multiple beacons requires addition of a controller.